After being postponed on last Friday due to forecasted rain, the field trip to the Ueno Zoo was finally on today. 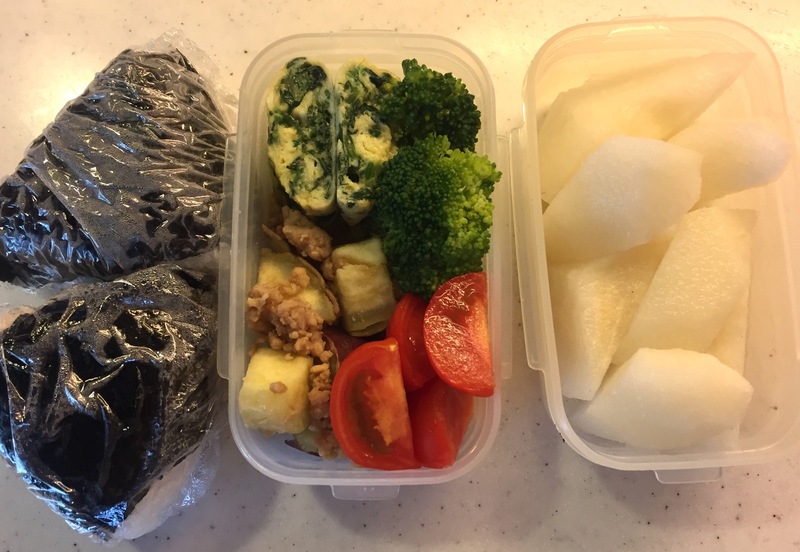 This means I need to prepare another field trip bento, and this time, our daughter requested onigiri balls. Actually there was a specific instruction from her school for what kind of bento we should prepare for the field trip. Onigiri, sandwich and the like, something that the kids can easily pick up and eat, rather than using chopsticks or cutlery. They told us to make sure the kids bring a water bottle with a strap so they will be hands free at all times. On top of that, they advised us to pack “oshibori“, the wet hand towel, so the kids don’t have to look for a water fountain to wash their hands at lunchtime, and no waste will be produced at the same time. Despite the fact I occasionally feel a little annoyed to be instructed in such great detail, I highly respect their teachings. With years and years of experience spending time with small children, these teachers know what they are talking about. Oh and just FYI, our daughter and her friends (around 60 of them) went to the zoo without being accompanied by their mum or dad, which means they walked from school to the nearest metro station on foot (10 minute walk), took a metro to the nearest station to the zoo (10 metro stops), walked around the zoo (quite large), took the metro back (another 10 metro stops), and walked all the way back to school (another 10 minute walk), solely with the handful of teachers (7 – 8 of them). They all came back safe and sound.